As I sit down to write this I feel so tired. I am so tired of all of us having to have conversations like this. I'm tired of the news stories of wrong doings against each other that prompt such conversations. Not that I hate having them, I just hate the reasons why. I went in to work Monday night not knowing what I would find or be up against during my shift. Security had been beefed up, and later in the night the National Guard was there, in the ER parking lot, a guardsman at the entrance making sure all was well. 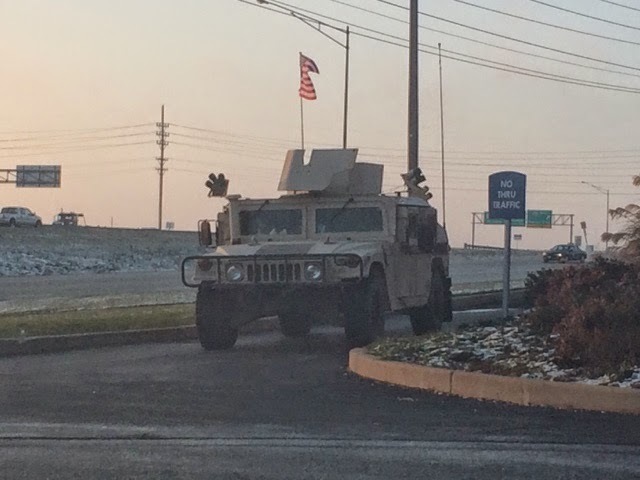 Tuesday night there was a Humvee stationed at the entrance to the main ER parking lot, and I knew that we were still needing to be under a watchful eye. I am not upset that they were there, on the contrary, I am thrilled to feel so secure. However, I never thought I'd have to see this sight. It is certainly surreal, if nothing else, the fact that they have to be there. I mean, I work in a hospital, for crying out loud. In America. I'm not even in the "big" city. I am certainly not in a war torn land risking my life to save lost and injured souls from eminent danger (though, some days I wonder...). The unrest in Ferguson, Mo. has raged, smoldered, rekindled and blazed anew into a situation that we may never understand how to fully extinguish. It is a representation of a cancer in this country, quite possibly the world. Even now, after the Grand Jury has made their decision and released the evidence we have all been waiting to learn for the last three months, the story of what really happened that day is still sort of in limbo, and may always be. Opinions are STILL being regurgitated, in spite of the evidence. That's just human nature, I guess. The same story can be told a hundred different ways by a hundred different people. So how did we get here? Why did we get here? I was browsing facebook and came across an article about the 1950's civil rights-era America "photo essay" by Gordon Parks (among being a photographer and writer, he directed the movie Shaft). I was enchanted by his photos, and it brought up a burning question in me (of course, right?). I'm posting the link for you here so you can see for yourself what I'm talking about, and I urge you to take a look at the few photos in this collection that moved me so. The first thing I though while looking at these was, "Why didn't the rest of (white) America see these people as the same as them?" The second thing that came to mind was, "What if, at that moment in American history after the civil rights movement was won and integration was afoot, black Americans were seen and treated as equals?" I think that this country would be a very different and much prettier picture. If Integration was accepted and happened fully and lovingly and all people were treated equal, can you imagine how much anger and disappointment and shame and fear and hatred would have been lost from the books? What if, at that moment in time, families were accepted as equal, men were not looked down upon as "less than" because of their skin, women were able to have jobs other than nannies, maids and cooks--if they wanted. What if there were no separate lines to walk your children up to for an ice cream treat after Sunday services or one for the water fountain or bathroom? What if these children were allowed to go to the fair they longed to run and play at, eat cotton candy and have the thrill of a once-in-a-lifetime ride like every other child in town, instead of only getting to watch longingly from the fence across the field? What if all the children of that particular era grew up feeling equal to, instead of less than? If they were given the opportunities to succeed that they could pass onto their children and grandchildren, and so on? But, this is what we have now, and there's no use looking backward. We must take these lessons and go forward, learn from them and start anew. There is a lot of hurt. There is a lot of anger. There is a lot of wrong needing to be righted. Destroying each other now is not the answer. Yesterday, I found a video that has some valid points and can be applied to EVERYONE of all races and situations. We need more examples like this young man. And another from the same page out of Milwaukee of a passionate police chief who addressed the crime rate after being accused of acting too lackadaisical while at a crime scene. (*Note: These are very emotional, blunt and the sole opinions of the speakers. My linking to them here does not necessarily mean I agree or endorse their opinions, though I certainly may. Watch for yourself and form your own opinion). Though I may agree with some of the thoughts in the first video, there are some who will not. According to the comments on the feed it is from, there are plenty of people who don't. Do I, as a white person, even get to agree or disagree? Is it even appropriate for me to address this issue? I think it is. Without dialect about these issues, we stay confined to our ideals, never seeing any other side to the coin; and there are always different sides. You have to be open enough to get to that point where you are willing to see them and discuss them. Only through transparency will real change come. What I have come to realize in my career and life is that not everyone is bad. Some people are just lost. Some refuse to be found. It's frustrating to watch the self destruction of someone, let alone their destruction of everything around them. I'm sure there are reasons that people struggle with these behaviors that are beyond our comprehension. I can understand what it is like to grow up poor; not as poor as some, I'm sure, but, definitely less fortunate than others, to say the least. I have often argued the point that, when you grow up in the cycle of poverty, and it is all you know, it may be quite difficult to overcome. When you are raised as a minority, in minority communities where you have been perceived and maybe even taught, that you are "less than", it is difficult to ever believe that you will ever be able to overcome your situation if there is no one to encourage you to do so. If you have no examples of success or strength, you don't learn to have faith in yourself enough to believe that you are strong enough to pull yourself out of it. I think it takes a special person to have that inherent belief in themselves. Only 15% of women who are abused, don't return to the relationship. That means 85% of battered women return to their abuser. So, what makes that 15% so special? How about the women who sense the relationship is going bad and know to get out immediately and not look back? Is it their upbringing? Inner strength? Self respect? How do they "just KNOW" that they deserve better? I think it often takes that special thing inside of you to just know how to stand up for yourself and know what's best for you. The rest needs to be cultivated. And some of that cultivation will just be outright ignored. Just like in the video above, taking responsibility for yourself, while daunting at times, is really the only thing you can do to ensure your own success. This is what upset me the most about the Ferguson riots. I work near there, serving this community for over 12 years. I've seen the Ferguson, North county and Jennings police in action when they brought in detainees, or taking report from a victim. The stories go both ways. So I fancied myself understanding of both sides, and found myself frustrated when people's opinions were too one sided. There's always a way to see both sides, if you care to. When I wrote about my mother-in-law's murder, I was in a state of peace. Over Thanksgiving (two days ago) Noah's grandmother was with us at our house and we found out that the man who took his mom from us had his sentencing moved up to February. It was supposed to happen this month. And July before that. And April before that. Every four months or so, it's moved up four months. Noah's family needs this closure. What do we do? Do we go to Florida and protest the government? We could start some sort of appeal process. Plead to the court. The Florida victim's unit rep is doing that for the family already. There are laws and processes that are in place that seem unfair and tedious. You must choose the right voice to use in the situation at hand. Protesting peacefully to get the laws on how police conduct themselves during apprehensions and arrests is definitely going in the right direction. Signing petitions to get state and government laws changed is going in the right direction. Looting and stealing and catching a street full of businesses, most of them hard working small business owners who have poured their hearts, souls and bank accounts into their dreams is just wrong. It accomplished nothing but to prove correct those who expected that behavior from the people in that community. If you want to be perceived differently, you have to change the perception. I put out a plea on Twitter for the people in and around Ferguson to be united. That everyone expects violent behavior. Prove them wrong. You have a choice. You have a voice. It doesn't have to take violence to let it be heard. I was so saddened to see that people gave exactly what everyone expected: looting, violence, rioting, burning. And what did it do? What did it prove? Did it change the Grand Jury's decision? Did it change the hard evidence that they based their decision on? Did it change the world's perception of the people? Did bring Mike Brown back to his parents? Pain is unyielding at times; unforgiving. Emotions run high. We do and say things that we don't mean, are embarrassed of and cannot later take back. I truly feel for people who feel they have no way for their voices to be heard except through extreme measure like what has been shown in Ferguson these past three months. I pray every day for healing. I care for my patients in the best way that I can to show that I see no color, only the humanity that burns behind their eyes. That's the key, I think. Try to put yourself in someone else's shoes. See it from their side. Set your prejudices aside for a moment and be as you were meant to be--as one. Lead by example. Have pure intentions. Show someone you care about them, maybe even more than you care about yourself. Can you imagine what the world would be like? Will everything change tomorrow? Not likely. In a hundred years...a thousand? Who knows. But, trying for it with the intention of change is better than doing nothing. Even when it seems like a lost cause, you never know. There's nothing worth striving for harder than the uplifting of humanity. I wish you all such peace and calm during these trying times. Thanks so much for reading today. I appreciate each and every one of you.